I’ve been having a lot of fun with the spring ephemeral wildflowers this year. It is hard to believe the numbers and diversity that are in peak bloom already this year. I can’t imagine what the woods are going to look like by the end of April. You might as well stock up on pyrethrin because by mid-summer the ticks are going to be owning us all. This image was taken in the Labarque Creek watershed during a early spring hike. Bloodroot are fascinating plants, getting their name from the reddish sap that is especially prominent in their tuber-like rhizome. Several Native American tribes have been known to use this sap as a natural dye for artwork projects. These plants will spread and grow easily clonally and vast colonies can be found that may have started from a single individual. Another method of reproduction these plants use is myrmecochory, which means that their seeds are dispersed by ants. The ants feed on a fruit-like structure that is attached to the seed. The ants move the seeds to the relative safety of their colony and after the ants feed on the fruit they deposit the seed into their underground middens, or trash heaps. Here the seeds can safely germinate and have access to some useful fertilizer in the process. 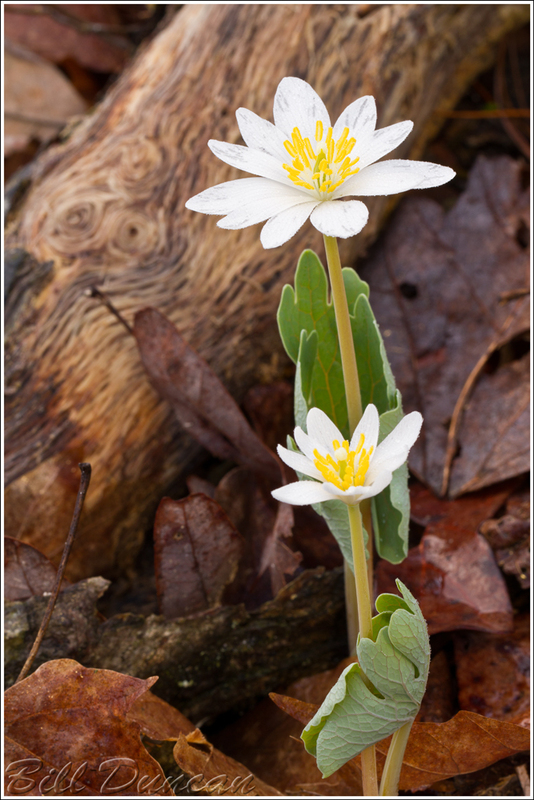 Bloodroot sends up a flowering stalk usually before the leaves begin to emerge and blooms usually open before the leaves have fully expanded. The flowers last less than a full day, so it is recommended you get out on the trail before noon if you really want to seem them in their full glory. Previous Previous post: It’s Spring Again. Everybody Know it’s Spring Again.